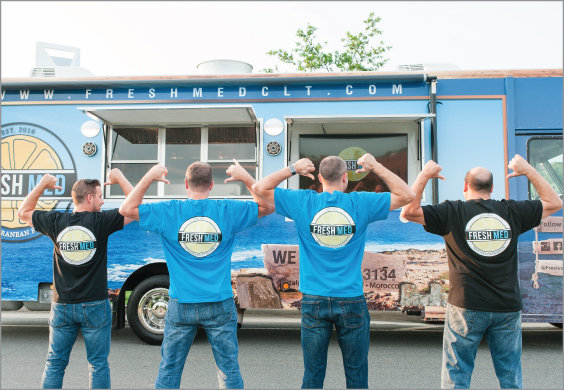 Fresh Med is a Charlotte, North Carolina based food truck featuring Mediterranean fusion cuisine. Our menu takes Mediterranean classics and creates an entirely new concept by combining some of your favorite flavors in a fresh new way. To keep up with where we will be, follow @freshmedclt on Facebook, Twitter and Instagram. We can't wait to see you at the truck! Please fill out the form below and someone will be in touch as soon as they are able. Great food and even better service. Stopped by for lunch today and everything was fantastic. Had a great conversation when one of the guys walked my food out to me which was a first for a food truck. I tried Fresh Med at Food Truck Friday in South End. I went for the lamb burger...AWESOME!!! So good that I am sure the Turkey Medallions and the Italian Grinder will be AWESEOME too!!! By far the best new food truck in Charlotte. I was thinking "dang we might wanna get another"
eating Fresh Med is one step to living life with no regrets. Excellent food. So far I've had the lamb burger, keftka skewers, turkey sliders, and hummus. The yogurt sauce is good enough to eat on its own. Hummus is wonderfully smooth and flavorful. Turkey sliders are insanely good. By far my favorite and close to perfection with their yogurt sauce. I have no idea how they make turkey so flavorful and juicy. Lamb burger is juicy and wonderful. The spiced sauce they put on it is just the right amount of mild heat and tangy. I always get the cucumber salad as a side. The dressing is amazing. Also don't skip dessert. The pistachio-baklava-honey-whatever is very unique and tasty. I would seek out the truck for it alone. Delicious food, fast service and one decked out food truck! Will be eating here again!